Is it weird that John read my headline in passing and used it as an opportunity for a comedic performance? A few “room-crisping” suggestions from him? 1) Flambé it. 2) Put crunchy noodles on the floor. 3) Starch it. Funny guy. Anyway, here are seven super affordable and easy ways to freshen up any space. They might seem simple and straightforward, but it’s amazing what a difference these little tweaks can really make. So if you don’t have the energy (or the money) for a full scale room makeover, these might be just the thing to give you a new look in a snap. 1. Paint your trim with crisp white semi-gloss paint. Whether you’re repainting dingy trim or converting it from a wood tone, there’s nothing like sleek white trim to make a space feel dimensional, polished, and fresh- even a hallway! Think of your window, door, and baseboard trim as giant picture frames that can really showcase an area- and we all know that sometimes it’s the frames that make the art. 2. Introduce new outlet covers and wall switchplates. Sometimes you inherit them in pretty bad condition (they could be painted over, faded or dated in color, or even wallpapered- eeks!). So switching out your covers for crisp clean white ones- or even stainless steel beauties if that fits your decor- can instantly make the whole house read as updated and oh so current. Bonus points for painting out the trim on your doors for even more architectural interest! 3. 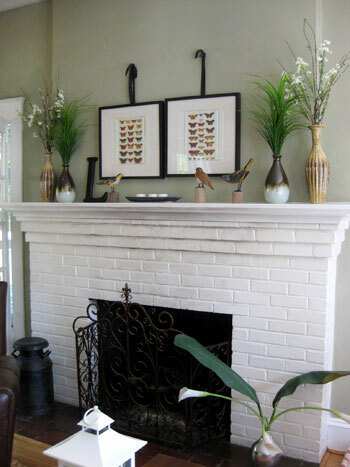 Paint a dingy and dark fireplace glossy white. Yup, more white paint is on the agenda here- but just look at how crisp and lovely it can look. And here’s a handy tutorial. 4. Hang breezy white floor to ceiling curtains. Ok, ok, so they don’t even have to be white- but if you have a flat looking neutral room with a tan sofa and a beige carpet, hanging long billowy white curtains (along with repainting your trim and switching out your outlet covers) will transform your room in ways that you almost won’t believe. And if your color scheme calls for off-white or linen colored curtains instead, as long as you hang them high and wide to frame the view, your room will instantly feel more airy and inviting. 5. Grab three to five punchy new pillows. Sure, safe neutral pillows are nice, but nothing pops like a bit of saturation in the form of plush pillows that really invite you in. And thanks to places like TJ Maxx, Marshall’s, Home Goods, Target, and Etsy you can grab pillows for around $6-$12 each. That means thirty beans is all it takes to give your seating area a totally fresh look. If you have a flat looking neutral room like we described above, there really are limitless options for accent colors (turquoise, steel blue, eggplant, amber, cinnamon, celadon, ruby, raspberry, peony pink, persimmon, lemon yellow, lime, etc). 6. Bring in baskets. They’re such an easy way to wrangle things and create a much more polished and organized vibe- even when it comes to kid clutter. 7. Add one more dash of saturated color. You can spotlight a bright piece of art above the mantel or you can get an old mirror on Freecycle or Craigslist and spray paint it the same punchy tone that you introduced to your sofa with those new pillows (lime? raspberry? turquoise? celadon?). Heck, even grabbing a cheap thrift store lamp and spray painting the base or recovering the shade in that playful tone will have the same effect without draining your wallet. So there you have seven quick and easy ways that you can make a room feel current and fresh (for everyone from potential home buyers to yourself). But we’re positive that we left something out. What small tweaks have you guys tried on for size when it comes to breathing new life into a stale or ho-hum space? Spill it. All images (except for the curtain pic) from fun and fabulous House Crashings of yore. Burning Question: Glass or Fabric? I love the crisp & clean look to your house… so these tips were welcomed with open arms this morning! I love the idea of replacing the outlet covers… anything would be better than the standard builder plates! Love these type of posts. Always looking for some fresh ideas. Katie B has the best pillows. L-o-v-e her house. We (and by ‘we’ I mean ‘I’) just changed out all of the curtains throughout our house to long white ones from Ikea. I have a fear of comitment when it comes to choosing patterened fabrics. Is that weird to have all the same curtains through the entire house? No way! We have the same white Vivan curtains from Ikea in nearly every room of our house! It looks breezy and cohesive- and you can’t beat the price! I love love love the crisp, white, finished look. My problem is that I have a miniature pinscher and her tiny little hairs look like eye lashes all over everything! :( I completely agree with the long sheer curtains though. Completely opens up and softens any room! What is your favorite paint color for trim? Btw, love the pictures you featured here, very inspirational!! We love Freshaire’s off-the-shelf white semi-gloss paint and Benjamin Moore’s Decorators White (both in semi-gloss) for trim. Hope it helps! Turn your furniture on an angle or pull it away from the wall. Even if you think your room is too small. Usually punches things up right away. My house has all wood (cherry colored) trim around the baseboards, windows, etc. The problem is after seeing how most people now have white trim, I love the look! We have a great room on the first floor that consists of kitchen/dining/living room. The kitchen cabinets are cherry. The walls are yellow in the kitchen and red (!) in the living room. Unfortunately for me I have one of those “wood colored woodwork only” husbands. I don’t want to paint my cherry cabinets white, but to make my very long story short, would white trim (if I can convince the hubs!) look too weird with cherry cabinets? Nearly every new-ish kitchen with wood cabinets has white trim so it can definitely work. Of course it’s a personal preference thing, but if it’s a look you love we say go for it! I love these ideas – they are totally do-able. We are moving into our first house in two weeks and I can’t wait to to paint the dark wood trim and doors in the upstairs white!! I’ll take before and after photo’s to show you just how awesome it looks when we get finished with it. Thanks for the great idea about the outlet covers. In thinking about our home, there are some yellowed ones that need replacing. I just wanted to share some advice to any readers with carpet. Take off the baseboards you’re wanting to paint. It’ll save you so much time and you won’t have to worry about messing up the carpet. It took us almost 4 coats (primer + 3 coats of latex semi-gloss) to cover our wood colored trim. And we found out halfway through our master bedroom reno that it’s easier to take them off and paint them then trying to shove a putty knife between them and the carpet. This post is awesome! I bought a new home and everything was off white and peach. I’ve started painting my currently off white trim Decorator White by Behr. Oh what a difference! I replaced the wall paper covered electrical covers and next I want to paint the fireplace white. Do you have other suggestions for colors to make it pop? Also, I have old flat, doors (off white of course, now sorta yellowed). Should I paint all 18 doors the color of my trim or would it increase the value/modernness of the home by replacing with the doors seen in the 1st picture of your post? We’re work-with-what-you-have people, so we think you could definitely paint your doors for a fresh look instead of replacing all 18! You won’t believe how fresh and crisp they’ll look when they’re the color of your trim (and not yellowed anymore). As for colors to make your fireplace pop besides white, we love mocha, smoky gray, or even a glossy chocolate hue. Hope it helps! don’t forget about Nature! Add a Plant! Any suggestions on what to do if your light switch is beige (not the cover, the actual switch)? We have the bigger type of switches (they’re not the little tiny normal switches, they’re wider rocker bars) that are beige. It’s an apartment so we can’t just rewire them for something white, and none of the light switch plate colors seem to go with them (at least I feel like they don’t). Any ideas, or should we just continue to lump it for the next year or two until we move? You can actually switch out the light switches about as easily as switching out the switchplates (you do have to turn off the power, but it’s as simple as disconnecting two wires and reconnecting them to the new switch, which is only a few bucks and very easy to do). It’s definitely worth the effort if the beige switches bother you (we did it a bunch of times here- and we love that we took the time to make the upgrade)! Awww, I spy the Bowers’ House! Love their house, love them. Love you guys too of course, but can’t help but smile when my favorite bloggers blog about eachother! To punch up a space I like to add something with black (or nearly black) or something that sparkles. I found a tiny writing desk/vanity that was in some sort of green shade – I painted it ebony and added glass knobs and voila! Instantly my neutral guest room felt like a new space. I think I really want to paint the trim in our house, atleast in the upstairs. Looking at your ideas and posts make me keep wanting something different for my house. We just finished the living and dining room and now I see other things I like- colors, etc!!! I love a lot of different styles and it is so hard to pick!! I dont think my husband would be up for repainting being that we just finished the living room 2 weeks ago,lol! I love your fresh modern look, and I also love a beachy, cottage type feel too, but I dont know if it fits my house. Decisions, decisions. Any tips for converting stained wood trim to painted? I idea of sanding, priming, sanding, painting seems so overwhelming and daunting. No sanding is necessary unless your trim is super varnished (you can just get away with one coat of oil-based primer and one or two coats of latex semi-gloss paint. Hope it helps! 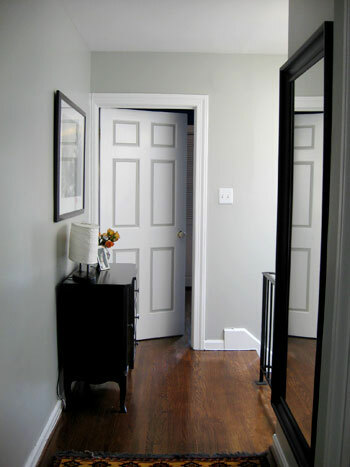 Oh how that Stonington Gray hallway makes me want to paint my entire condo that color right now! Love it so much! I love baskets – I have added some to my own rooms and they just transform it. Love this post!! I’ve already started doing the first 2 on the list (made SUCH a huge difference!) and I’m working on convincing my husband to let me paint our huge hideous smoke-stained red brick fireplace. To make matters worse the behemoth is on a wood-paneled wall, with wood flooring. Talk about dark! The other walls in the LR are painted a neutral mocha. Do you think painting over the paneled wall would make it look the same as the others, or would the texture (and thus the final effect) look too different? We say go for it! Our den has two brick walls and two paneled walls and although that’s not the same texture at all, the paint really unifies the room! When we moved into our house all our outlet covers and wall switch plates were brass. Bright shiny brass. (GAG!) I wanted to replace them with oil rubbed bronze covers, but those can get expensive when you have to buy enough for the whole house. So instead I got some oil rubbed bronze spray paint and painted all the brass covers. They look great and have held up fine for the past two years. Would you recommend painting outlet covers the same as the wall or keeping them the color of the trim? We actually wouldn’t recommend painting them with latex wall paint since it can peel (although some kinds of spray-paint work more effectively). So we like them the color of the trim (since they come in white and don’t need to be painted- plus they always look so nice and crisp). I’m all for most of what you’re saying. The only thing that gets me is the white fireplace. Our’s is a cream color and b/c we live in NE ohio, our favorite thing to do is USE IT. With that said, you get alot more smoke stain and proof of use when it’s painted a light color. 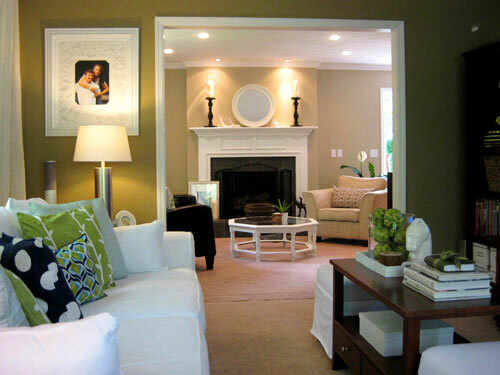 What about painting it a dark slater gray or a bold color that transforms the area into a focal point? We’re debating this now in preparation for the fall and winter and we’d love your feedback! We love boldly colored fireplaces as well! In fact we mentioned a glossy chocolate brown one a few comments back. The idea of a slate gray fireplace sounds lovely, especially if you keep it balanced by hanging a mirror (to reflect lots of light) or a piece of lighter art above it. Hope it helps! I cannot WAIT to tackle our final, major brightening project in our rental. Our giant living/dining area is a horrific shade of pinky-beige, and it’s just screaming to be painted a pale blue on the walls with bright white trim. i love your switchplate idea, too! ours are painted over– and will definitely get the boot soon. Great post! It is amazing the difference a little white paint can make….we are in the process of painting all of our doors and trim! We’re also replacing all of our beige switches/outlets room by room! We just finished (yesterday) repainting our trim. In our many renos we realized about a month ago that some of the trim was not painted at all… OOPS! We finally just finished it yesterday and it looks FANTASTIC!! I love crisp white trim! On a side note, my brother just bought a house and the old owners had painted the ceilings and the gorgeous old crown moulding beige… it looked AWFUL!!! Once they painted it all white it made the place look 100 times better! i love all these ideas! sounds easy and cheap! our living room furniture has a stripe pattern with bold colors. any suggestions on how to freshen and crisp that up? i feel like we are stuck to those colors in the stripe! i kinda wish we would have bought plain furniture now….lol! We would add a pop of some solid accent color (like red or lime, etc). Pillows on the couch are a great way to start. You’re so right about the white trim and curtains! We have the Ikea wilma curtains–pretty sheer, which I like. We used Behr’s Ultra Pure white–which is to say, their white base paint, before any tinting. Love it! Repainting the ceilings also made a huge difference for us (Behr’s standard white ceiling paint)–before, walls, woodwork and ceiling were all the same almond shade. We didn’t realize how dingy it was making everything look until we started painting! Re: Lisa’s question about painting switchplates–normally I’m with you on liking the crisp white look (we had to rewire all of our outlets and switches too to get there), I could imagine some cases in which an outlet seems to be in a particularly odd location, and you’d want to paint the plate to make it fade into the background. I’ve seen paintable switchplates at Home Depot, and I imagine they’re designed to work with standard latex wall paint. Not sure about paintable outlets, however…. I would definitely want my outlet and switchplate to match, but maybe not everyone feels that way. Fantastic advice! I am getting geared up to paint all the trim and doors in my dining room this weekend and can’t wait to have that lovely crisp look. One other tip is to change out the doorknobs – I am taking out the big wood round knobs and replacing them with gorgeous glass pull handles that I found on sale for 40% off – bargain! i had my son who was 6-7 at the time go to one of those paint your own pottery stores and paint outlet covers. by paint i mean he “threw down” a few colors I chose for each room & now I have custom outlet covers all over my house. they aren’t “professional” but they sure do get noticed when visitors come over. Love this post! Great ideas, thank you for the inspiration. I’ve started this trend of going to Trader Joe’s every Monday on my way home from running. I pick up 1 or 2 of their ‘market mixes’ which are all assorted bunches and $4.99 each. When I get them home I take them apart and spread them throughout our apartment: a little vase in the bathroom, a few single daisies on the windowsills in the kitchen…etc etc. It’s wonderful to spend so little and bring such joy!! I now look forward to running so I can pick up flowers on the way home, and it really makes such a difference. Do the long Vivan curtains from Ikea look okay if the window is not floor to ceiling size? For example, the long flowy curtains on a “normal” bedroom size window? Absolutely! We always hang them floor to ceiling and none of the windows in our house are even remotely large/tall. Hope it helps! Great tips today! I love ‘crisp’ looks – it makes me feel comfortable and orgainzed – does that make sense? I think painting ceilings can mae a huge difference in an older home. You don’t always realize how dirty and not-white they are anymore until you paint them. It really makes the other colors, especially the walls, seem brighter. I inherited brass pull knobs on white kitchen & bathroom cabinets. I switched them out to satin brushed nickel knobs I found at Lowe’s a 10 pack was only $9.99 so for roughly $20 I updated my kitchen & Bathrooms! Another option could have been to spray paint the knobs. Couldn’t agree more with the white trim idea! I took our tiny hall from off-white with blonde wood to toffee brown with white trim and I adore it. Check it out! 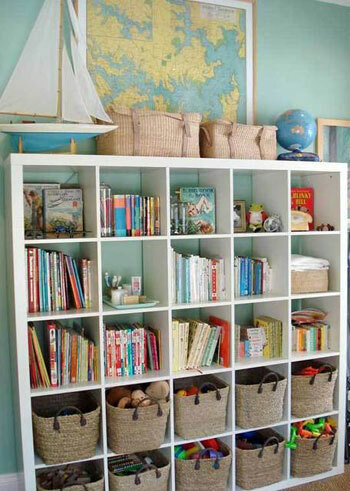 Another crisper idea is to just de-clutter. When I’m feeling cramped in my space, I find that taking everything down, cleaning really good and then putting back just a few things gives everything a fresh look. Ah, I love this post! We’ve done everything on your list (except the baskets) in an effort to lighten up our home. Painting wood trim (and the wood mantel) as well as changing the outlets,switches, and switchplates was definetly a huge payoff for minimal effort. That with some new paint on the walss brought our outdated home right into this century. PS – I love all you posts that formatted in a list (I think its the A-type in me), so keep them coming! Great post!! 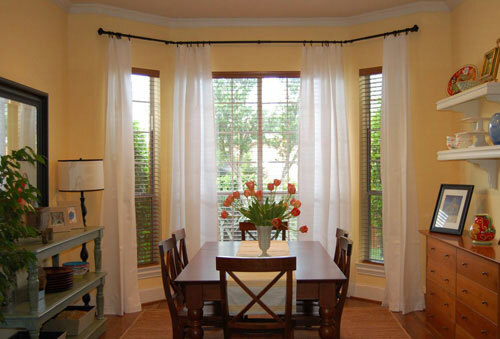 Question–we have an empty bay window like the one in the picture showcasing curtains–is that a special type of curtain rod?? Thanks! Alicia- Yup, it’s a special kind that you can pick up at a window-treatment shop. You can also hand individual rods flush against each other to mimic the look. Our apartment is currently on the market, so we’ve taken out all clutter and taken our furnishings down to a bare minimum. We also took all of our “art work” (aka Grateful Dead Posters) off the walls, so the place looks a little bleak. Long story short, I’d love to add some colorful throw pillows to our couch, but it’s a beige (not unlike the color on the right here)cordiroy type material and I have no idea what would match. Any suggestions? Your sofa is a neutral so anything matches! Bring home pillows in a ton of fun colors (lime, aqua, red, orange, gold, etc!) and just see what you like. Then return the rest! White trim does wonders! We took it a step further and created white mouldings in our entire house: http://ourhumbleabowed.wordpress.com/the-grand-tour/ It definitely feels lighter and brighter. We also have some white curtains and bright pillows. Pillows are great because they are SO easy to change when you want a new look. LOVE this post….I am going to get to work on a couple of these steps tonight! I would love to get some great accent pillows, but have NO CLUE what to pair with our furniture. It is a sage green microfiber couch and oversized chair and ottoman…I am having trouble choosing a color other than “cream” or “brown” but would love to add some punch of color other than the neutrals…thoughts? We actually love how blues and greens can work together, so try bringing home some soft aqua, gray-blue or slate blue pillows for that sage couch (picking up a variety of options and retuning the ones that don’t work is a great way to get the best look). Good luck! These are great tips. 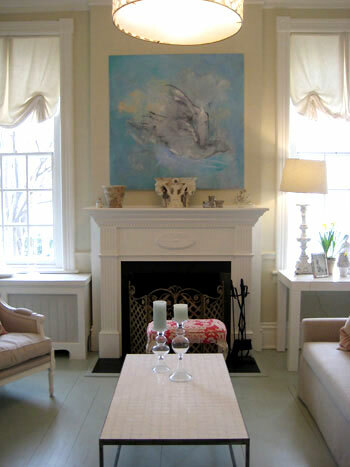 It is amazing what a transformation white trim can make throughout your home. Our home was built in the late nineties and had off white trim. We changed the trim color to white soon after we moved in. I was amazed at how the wall colors seem to “pop” more against the white, and the white trim makes everything feel more updated. Also, our couch was beginning to look very tired and the throw pillows that came with the couch were well worn. I was surprised by what a difference new pillows from Homegoods made in updating my “tired” couch. The pillows that came with the couch all matched and made my living room look very uninspired. When I purchased new pillows, I chose several different fabrics all with a cohesive color scheme. I love the result. All of these ideas are wonderful. I’m a storage bin gal and I’m thinking baskets will give our place a softer look. Thanks for all of your wonderful ideas! One more thing… Clara is too stinking cute! Thanks for the inspiration! I love using baskets. I have three kids with a million toys, so baskets help keep my house looking oraganized. I love that you guys answer questions in the comments, not all bloggers do that. That’s just one of many reasons why I like reading your blog. Thanks!